In this article, we will install Mastodon on one of our Ubuntu 16.04 virtual servers. WordPress is one of the best open source content management systems written in PHP you can use to create websites or blogs. In this tutorial, we are going to provide you with step by step instructions on how to install and configure the W3 Total Cache plugin on an Ubuntu 16.04 VPS. W3 Total Cache is a great WordPress plugin and it is mainly used to increase the website performance by reducing the download times. 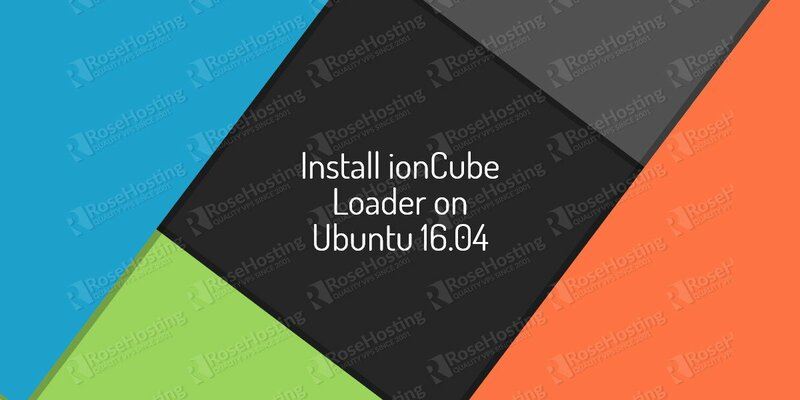 IonCube loader is a PHP extension for decoding secured and encrypted PHP files at runtime. It is free and you can install it quite easily, adding just a single line in the PHP configuration (php.ini) file. The benefits you get by adding a single line in your PHP configuration file are uncomparable to the time you need to do it. It’s worth it, it won’t take up too much of your time, and it’s easy to do, especially if you follow our tutorial. vnStat is a lightweight bandwidth monitoring tool for Linux and BSD that keeps a log of network traffic and provides monthly, weekly and daily tracking metrics. The following article will describe how to install and configure vnStat on an Ubuntu VPS. In this tutorial, we’ll show you, How to install ActiveMQ on Ubuntu 16.04. ctiveMQ is an open-source, message broker software, which can serve as a central point for communication between distributed processes. In other words, it’s used to reliably communicate between two distributed processes or applications/services that need to communicate with each other, but their languages are incompatible between each other. Since its creation, ActiveMQ has turned into a strong alternative to the commercial alternatives like EMS/TIBCO or WebSphereMQ and it is actively used in production by some of the top companies ranging from financial services to retail. Installing ActiveMQ on Ubuntu 16.04, if pretty easy task, just follow the steps bellow and you should have it installed in less then 10 minutes. There is very little information on how ActiveMQ is installed. In reality, the installation is pretty straight forward, but and the official documentation is very vague and this leads to frustration in an inexperienced person. In this blog post, we will explain how ActiveMQ can be installed on a Ubuntu 16 VPS. Chamilo is an open-source e-learning and content management system. It allows you to create a virtual campus for the provision of online/semi-online training. In this tutorial, we will show you how to install Chamilo on a Linux VPS. For the purpose of this tutorial, we will use a virtual server with Ubuntu 14.04 installed as an operating system. Nextcloud is completely free and open-source cloud software alternative, giving the user full control over their data and allowing them to store and sync their data from numerous devices to their Nextcloud server. It is founded by the co-founder of ownCloud, and it is a great free alternative to the popular platforms such as Google Drive, Dropbox and OneDrive. In this tutorial, we will show you how to install Nextcloud on one of our CentOS 7 virtual servers.